These stainless steel sponges offer thorough, optimal results. 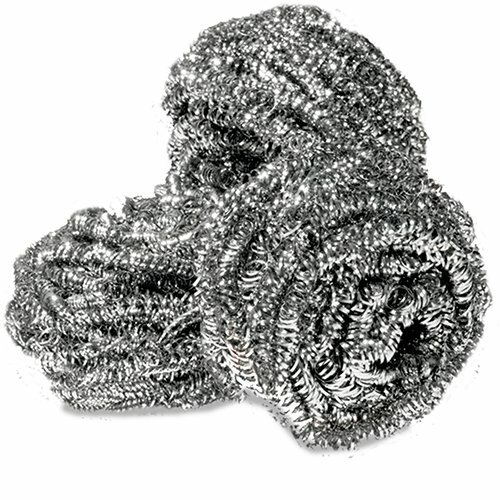 They are made from tightly coiled stainless steel and are capable of aggressive scrubbing and scouring. Perfect for removing grease and grime from pots, pans, baking dishes, and more, these sponges are ideal for dishes that can handle heavy duty scrubbing. These sponges are capable of being used for extended periods of time without rusting or becoming splintered. Safe, effective, and long lasting! STAINLESS STEEL CONSTRUCTION: These sponges are made from stainless steel. They are flexible, and made from tightly coiled stainless steel. They are an aggressive cleaner meant for sturdy, hard to clean dishes. RUST-PROOF: If properly cared for, these stainless steel sponges will not rust. Ensures long lasting lifespan of the sponge. These aggressive sponges give optimal results. WILL NOT SPLINTER: These sponges will not splinter or shred. They are designed to keep their shape without splintering even after many uses. Safe to use without getting splinters. CUT THROUGH GREASE AND STAINS: These stainless steel sponges cut through stubborn stuck on foods and residue from pots, pans, baking dishes, as well as ovens and grills with ease. Perfect for restaurant or commercial kitchen use. RESTAURANT AND COMMERICAL KITCHENS: These sponges are great for use in commercial kitchen or restaurants. Their durable, rugged nature makes them perfect to clean messy dishes in commercial settings. If you have any questions about this product by Royale, contact us by completing and submitting the form below. If you are looking for a specif part number, please include it with your message.